Dixie’s Home Cookin’, which has been doing business in Sumner for at least 13 years, is named after the proprietor’s father, a firefighter from Indiana who loved good food in generous portions. It is open for breakfast and lunch, serving everything from a build-your-own omelette at $7.99 to “Dad’s Big Breakfast,” which includes four eggs, four meats, pancakes, and sides for $17.99. This friendly spot has a cozy atmosphere and a selection for everyone. The menu had 34 types of breakfasts, including loaded potato pancakes at $6.99, 17 kinds of burgers, 23 sandwiches, 17 salads, and meals ranging from meatloaf to fish and fries. Selections came with soup, salad, fries, or tater tots. Stopping in for a meal, we decided to try the Pot Roast Dip at $12.99, a hoagie roll loaded with big chunks of boneless beef short rib, Swiss cheese and grilled onions, served with au jus, and we had a bowl of wild rice vegetable soup which came loaded with carrots and other garden vegetables. We also had the Cuban sandwich ($12.99), a combination of pulled pork, ham and swiss cheese, pickles and dark ale mustard on a whole grain ciabatta roll. A side salad came with this. We also ordered Fried Chicken Salad ($11.99), crisp sliced fried chicken, iceberg lettuce, (my favorite green,) sliced eggs, chopped tomato and ranch dressing. The portions at Dixie’s are very large. As an example, I ordered my ranch dressing on the side and it came in a soup bowl! Everyone really enjoyed their food, and we had plenty to take home for another meal. Our lunch was enjoyable, and we are looking forward to a return visit. The next time I go, I will order the carrot cake, which looked delicious. Dixies is located in a strip mall near the center of Summer. Parking is limited by the number of businesses in the mall, but there is plenty of seating at tables and booths. Service is friendly and prompt. The prices are in keeping with the size of the meals. No reservations necessary. Carolyn Augustine is a freelance restaurant writer from Lakewood. 15717 Main St. E., Sumner. From State Route 410, drive to the East Main exit and drive east back through town until you see the big windmill at Windmill Garden Center. Look on the left side for the restaurant. No reservations necessary. 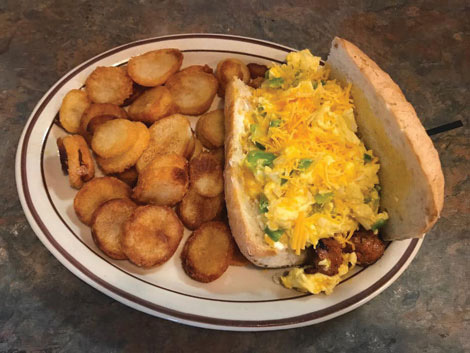 Open Monday throuigh Saturday 7 a.m. to 3 p.m., Sunday 7 a.m. to 2 p.m.
A German Sausage breakfast sandwich on a hoagie, served with potatoes, is among the big variety of breakfasts served at Dixie’s Home Cookin’. Log in | 49 queries. 1.357 seconds.